There is a common misperception that organizations can make their greatest social impact only through grantmaking, while the organization’s capital is solely used for the purposes of maximizing return. In other words, if an organization were a person, the head would be responsible for earning the dollars and the heart would be responsible giving them away. The two need not remain separate, however, as impact investing seeks to combine the desires and functions of both the heart and the head. With every additional dollar earned, an additional dollar of good can be done, and even more good is done when the earning of the dollar creates the impact an organization is seeking. Thus, impact investors challenge the perception that social and environmental issues should only be targeted through grantmaking, and that investments should focus exclusively on achieving financial returns. Impact investing can vary not only in the targeted impact, but also in the investment asset class, providing a full spectrum of return opportunities in both impact and capital. We discuss not only these elements, but some considerations for those exploring impact investing. Just as important as what an impact investment is, it is equally important to understand what an impact investment is not. An impact investment is not a grant, which assures a 100% loss of capital. Unlike a grant, there’s an expectation of a return of capital and a range of possible returns on capital with impact investing. On the other side of the spectrum are traditional investments that seek to maximize return. In between these two extremes are the infinite shades of impact investing. Investments can range from relatively low-risk opportunities, like local loan guarantees or microfinance, to higher returning strategies such as a for-profit venture fund. An impact investment stands in both worlds and acts as a bridge between making money and spending money. Defining impact investing can be difficult because it takes so many different forms. For example, something as simple as opening a checking account at a local credit union could have an impact on your community, as those dollars are used to provide lending to other members of the community. Impact investments exist across all asset classes, sectors, and regions of the globe, all with various ranges of expected returns. 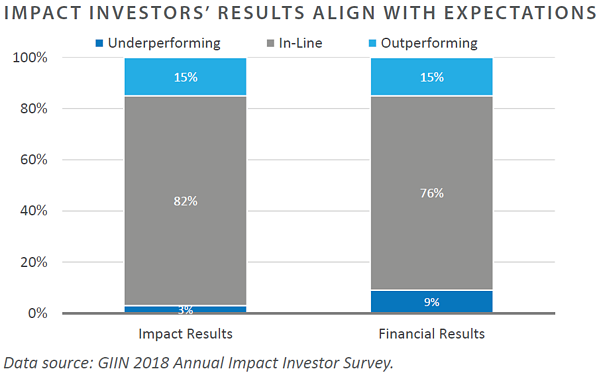 While impact investing falls under the Responsive Investment (RI) umbrella—see call out box for more detail— impact investing has some key differences from other elements of RI. Impact investments explicitly seek out investing in something the investor likes, rather than divesting from something disliked. 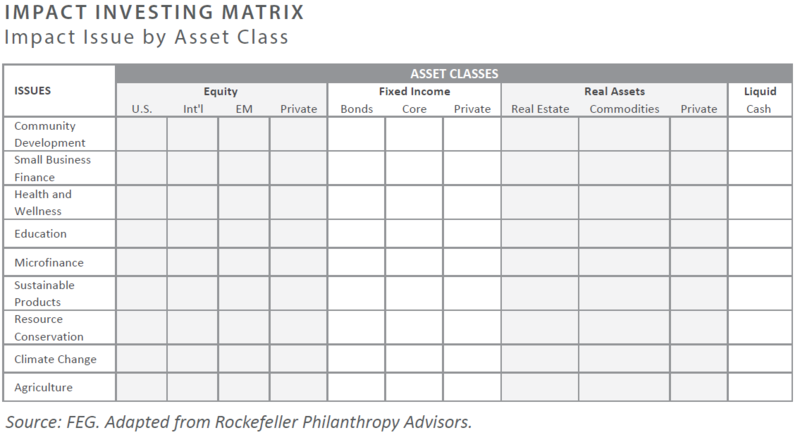 Despite early classifications as such, impact investing is not a separate asset class. More and more investors are now categorizing their impact investments similarly to traditional investments. For example, a loan to a housing development not-for-profit would be considered a fixed income instrument and part of an organization’s fixed income allocation. An investment in a local start-up venture fund would be considered a private equity allocation. Because impact investing is not a separate asset class, there are two fundamentally different ways to approach impact investing. Starting with the traditional asset allocation framework, investors look for opportunities to generate impact within any given asset class. Alternatively, an investment may begin with a desired impact in a specific sector/issue area, at which point the investor looks for investment options across asset classes to help achieve that outcome. The framework below can help investors with either approach as they prioritize asset classes and sectors of interest to develop customized investment solutions. Some investors may assume that they must accept a lower return relative to risk-adjusted market rate returns. Further, investors may fear that below-market rate loans jeopardize the principal, essentially turning an investment into a grant. The data reveal some optimistic trends, however. 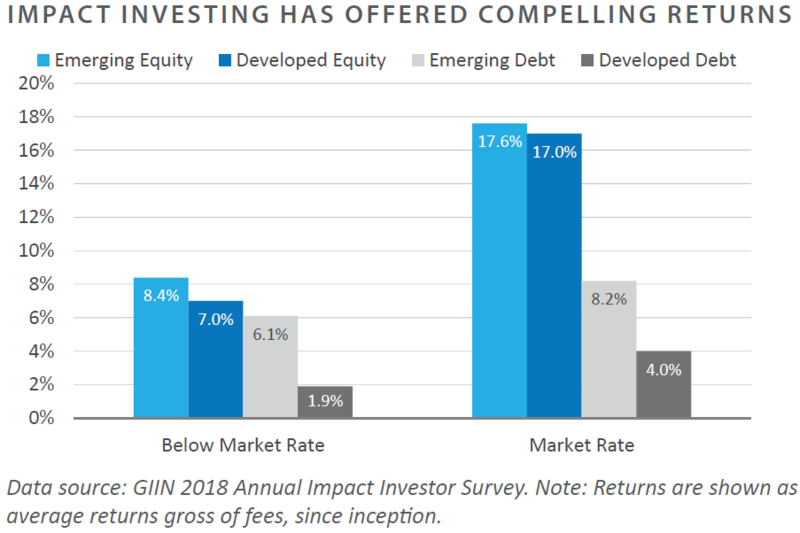 Further, the 2018 GIIN Annual Impact Investor Survey indicates that rates of return have been adequate for investors to continue with their impact investing program, with over 90% of respondents stating that the impact results are in line or in excess of their expectations. Return expectations are similarly optimistic, with 91% of responses indicating in line or exceeding. Many foundations are beginning to explore the idea of impact investing but struggle with how to participate. Finding that optimal balance between the traditional skills of finance and the considerations of impact can be a challenge, but also an opportunity. Options for impact investing can range from investments designed to address the needs of the local community to supporting global strategies designed to target worldwide social and environmental issues. Solutions range from independent one-off local deals to hiring an impact investment manager who will invest your foundation’s dollars alongside multiple other foundations. Regardless of size and initiative, however, impact investors all share a conviction that creative investments can play a crucial role in addressing social and environmental challenges. Does this investment have intentionality? An investor should have the explicit intention of having a positive impact that aligns with an organizations’ goals. What it the expected return and risk? Impact investors need to consider whether they are seeking below-market return investments looking to maximize impact of their grantmaking with program-related investing (PRI) or if they are seeking market returns with impact as a component to their investment portfolio with mission-related investing (MRI). PRIs are made with the expectation that the invested amount will be repaid over a structured term limit. Once returned, the proceeds will then be recycled into new loans. MRIs are market-return-seeking investments in enterprises and funds that support the foundation’s mission. For example, a foundation focused on sustainability might invest in the development of alternative sources of energy. A foundation working to improve health outcomes may support businesses developing new diagnostic technology. What is the optimal vehicle for investment? Is your foundation considering, and does it have the expertise to assess local opportunities as they are presented? Or, would you benefit from investing through an impact investing fund? What is the geographic scope and what are the primary concerns you are trying to address? Impact investments can be made globally or in one’s backyard. Whether you are committed to securing affordable housing for low-income individuals, erasing global poverty and hunger, or providing equal access to quality education, there are local and global investment options to target this area. What does success look like and is it measurable? Impact investments seek to generate a financial return on capital or, at minimum, a return of capital. They also should have a positive social impact. Determine how to measure both to help double—impact and returns—your bottom line. Impact investments can help foundations maximize their positive impact on society and further their mission. As the impact industry continues to mature and additional institutions enter the market, an array of strategies and approaches will only continue to develop to help meet those demands and help ensure impact. In sum, impact Investing is identified by three key factors that include intentionality, a goal of positive societal improvement, and an expectation of a repayment of the investment plus a return on the investment. Investors need not assume that a lower return must be accepted to achieve a social benefit as well. Those investments that pay off for society have ways of providing returns over the long term for the investor. Also, impact Investments are not an asset class; rather, they are found within all asset classes and exist globally to support a myriad of societal benefits. If you are considering implementation, review the “considerations checklist” with your board or committee. We would also recommend reaching out to your consultant or advisor as they might have already implemented a program with other clients. Combining your organization’s head and heart may be more attainable than you thought before. 1 “Introducing the Impact Investing Index”, GIIN and Cambridge Associates. 2"Great Expectations: Wharton Social Impact Initiative”, Wharton School of the University of Pennsylvania. Published October 2015. This report is prepared for informational purposes only. It does not address specific investment objectives, or the financial situation and the particular needs of any person who may receive this report.